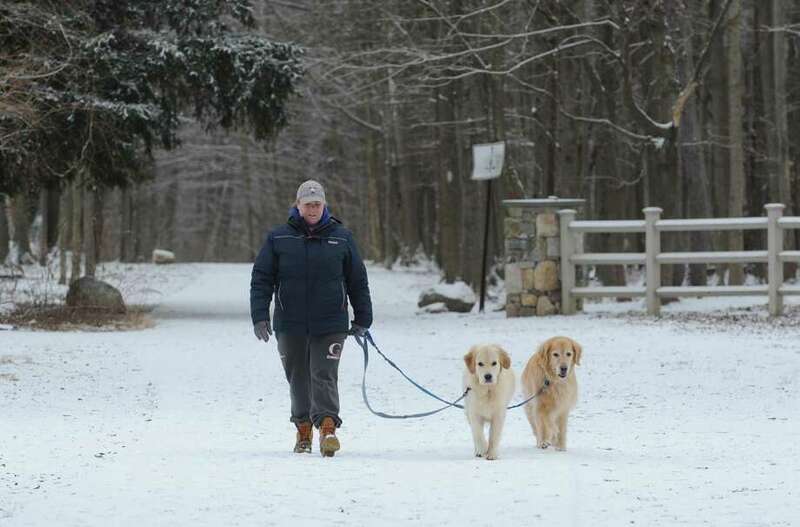 Norwalk dog walker Kate Deforge trods through the light snow at Cranbury Park with golden retrievers Charlie and Austin on Friday in Norwalk. BRIDGEPORT — The state’s first major winter storm of 2019 is expected to bring snow, ice, sleet and freezing rain this weekend. 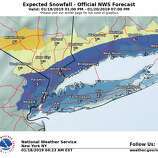 A winter storm watch is in effect Saturday afternoon through Sunday afternoon for southern Connecticut, southeast New York and northeast New Jersey, the National Weather Service said. Southern Connecticut is expecting between 3 and 6 inches of snow, with higher totals possible in the northern part of the state. A foot or more of snow is possible from northern Pennsylvania to upstate New York and northern New England, said Frank Strait, senior meteorologist with AccuWeather. State Department of Emergency Services and Public Protection officials said they are in constant communications with the NWS to ensure readiness for the storm. “We will be monitoring conditions statewide and are prepared to coordinate any assistance that may be needed,” said Scott DeVico, a spokesman for DESPP. Leading up to the weekend storm, towns and cities and state agencies monitored the impending snowfall, looking to prevent the struggles that hit statewide during a snowstorm in November. That storm caused slippery roads and snarled traffic during evening rush hour. Connecticut State Police responded to 1,341 snow-related calls during the storm, including 230 crashes — one of which was a fatal crash on Interstate 95 in Milford. Ahead of the weekend storm, the Connecticut Department of Transportation pretreated more than 300 miles of problem areas across state-run roadways, according to DOT spokesman Kevin Nursick. The salt-brine solution, which started to get applied to roadways on Wednesday, makes it easier to plow. Nursick said the DOT’s fleet of more than 800 plows should help adequately deal with the weekend’s snowfall. On local roads, public works departments battle with quickly clearing roadways when vehicle owners don’t adhere to parking bans. In Bridgeport, a snow emergency was declared to take effect at 7 a.m. Saturday. “We need residents to help us out to ensure that we can efficiently and effectively get the snow cleared,” said Scott Appleby, director of emergency management and homeland security for Bridgeport. In 2013, Bridgeport officials under then-mayor Bill Finch were criticized for the way they handled a February storm that dumped nearly 30 inches. The cleanup cost the city about $1.7 million, which was only partially reimbursed by the Federal Emergency Management Agency. Heavy snowfall and winds are expected with Saturday’s storm, leaving the potential for power outages. If evacuations are necessary, Appleby said, the EOC will open up shelters based on the need. Bridgeport is working with homeless shelter agencies in the area. If there is a need for overflow shelters or warming centers, he said, the city will provide it. Eversource Energy, which was heavily criticized for restoration of widespread power outages after two major storms last fall, is also preparing crews to address any possible storm-related outages. “We are closely monitoring weather conditions and planning accordingly so we have crews in position to respond,” said Mike Hayhurst, Eversource vice president of electric system operations. Michele DeLuca, deputy director of emergency management in Norwalk, warned residents to take precautions to keep safe as temperatures drop. If you are using a space heater, DeLuca said, make sure it is at least 3 feet away from anything that can burn and turned off when you leave the room or go to sleep. As the snow lets up Sunday, Strait said, the real concern will be the low temperatures and the wind. Gov. Ned Lamont launched statewide cold weather protocol, which goes into effect noon Sunday and remains in effect through noon Wednesday. Once the protocol takes effect, the DESPP activates an internet-based system that allows local, regional and state emergency management officials and first responders to information about a variety of situations and conditions. Those seeking shelter can call 211 or visit www.211ct.org to find the nearest shelter options. “It’s expected to get very windy on Sunday and temperatures will just drop during the day,” Strait said. Current forecasts are calling for temperatures to plummet Sunday night, hovering near zero degrees by daybreak Monday. Wind chills are expected to be between minus-10 and minus-20 degrees. The high on Monday will be around 10 degrees with wind chills remaining below zero during the day. Tuesday temperatures will remain below 25 degrees with wind chills in the low teens. Wednesday brings more moderate temperatures above freezing.